John Cena finally made his long-awaited return to WWE on SmackDown Live. The fans gave Cena a warm welcome and he was soon met in the ring by Becky Lynch. Lynch told Cena to be careful around her or Nikki Bella wouldn't be the only woman to drop him. The duo was interrupted by Zelina Vega and Andrade 'Cien' Almas and Cena challenged them to take on him and Becky Lynch in a tag team match. John Cena's WWE return was announced on the Christmas Eve episode of WWE RAW where Mr. McMahon himself announced that Cena would be returning and appearing on 'both RAW and SmackDown'. However, hold your horses, Cena fans - because Cena's return may only be short. 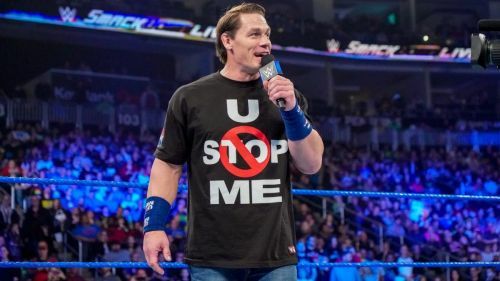 According to reports, John Cena will start shooting for a new film on 20th January in Canada and if that is true, it definitely rules out the leader of Cenation from taking part in the 2019 WWE Royal Rumble and possibly even WrestleMania. Vega and Lynch started the match. Lynch had Vega on the backfoot immediately and forced Amas to tag himself in. Lynch reluctantly tagged Cena in. During the match, Cena ate a cheap shot from Zelina Vega twice! Lynch came back and in and absolutely destroyed Zelina Vega. Cena came back near the end to hit Almas with and an AA but Lynch didn't take too kindly to it and just sent Cena crashing out of the ring. Then she locked in the Dis-Arm-Her on Vega and made her tap out. Cena tried to shake Becky's hand at ringside but Lynch just did the "You can't see me gesture" to Cena. We have to wait and see if John Cena does indeed play a part at the WWE Royal Rumble and for WrestleMania season. There are no details available yet but we should have a better idea soon.